It’s funny how God just keeps throwing the same themes at us. This week, the theme God has continually thrust me into the midst of has been the lives of the elderly. As a minister, I spend a lot of time with the elderly, anyway. It’s no secret that overall, church populations are aging. So, even as a parish minister, one can’t help but become accustomed to doing ministry with older adults. Yesterday, God reminded me of the tremendous gift of body that has been given to us. Today, God has reminded me of the wonderful gift of companionship. The elderly are lonely. I don’t intend for that to sound so hopeless and desperate… but it is a simple truth. The elderly, particularly those who are homebound, are lonely. They have reached an age where their bodies are no longer able to hold up to the rigours of their youth. They find even simple actions to be difficult. Their eyesight or hearing… or both… are failing. They have aches and pains and ailments that limit them. And because of all that, they are not as likely to be as social as they once were. Even an introvert, like me, would get lonely if every day was spent, confined to one floor of my home, unable to visit old friends or family, and unable to participate in the social and community events in which I used to take part. For those lucky enough to have plenty of family and able-bodied friends around, they might expect a visit a day. But even that doesn’t begin to fill up the amount of time that social activities used to fill up. For those who have seen their families move on and their friends become as limited as they are, things are even lonelier as visitors arrive less often. Today, I had the chance to visit two of my elderly parishioners. Bill has been confined to a long-term care ward at the Veteran’s hospital for as long as I have known him. He is in his early nineties and in his day was quite an athlete. He was a runner back before the cult of running made it popular. Everyone around town knew him from his morning six-mile jog. As age caught up, it became a walk. But he always made his rounds around town. June is in her eighties and has been in poor health for years. Pain makes it difficult for her to move, and she can only get around with the assistance of crutches, and even then her mobility is extremely limited and difficult. It is only because of her children that she is not completely homebound. June and Bill are both widowed–both have known what it is to lose their companion in this life. But they have both been animal lovers since childhood and have both always had pets. When I visited Bill today, I was thrilled to see that his little friend was with him. I have come to enjoy seeing Casey the dog as much as I enjoy seeing Bill. And I never stop being thankful that the Veteran’s hospital allows Bill’s dog to spend the day on his bed with him. Even if Bill is having a bad day, the soothing influence Casey has on him is noticeable. All it takes to calm Bill’s nerves is a moment of petting his beloved dog. June lives at home, but she is unable to move around her home very well. As a result, she must spend most of her time in one spot… but her faithful little friend, Punkin, is right beside her. Punkin greeted me, loudly, at the door today and escorted me into the living room. She quickly found the perfect spot on the couch between June and I–in a place where she could lay her head on June’s lap and be petted by me. And every time I tried to quit petting, she let me know it was unacceptable. In both visitations I marveled about what good companionship dogs are, and June and Bill sang the praises of their furry little babies. Without Casey and Punkin, they would be far lonelier, and they knew it. All too often, when a person reaches a point in their lives in which they must enter nursing homes, long-term care facilities, or assisted living homes, they are forced to abandon their companion pets. Likewise, many elderly people who find themselves limited in mobility will be pressured to “get rid” of their pets because they are no longer able to care for them. However, the presence of a pet, especially with life-long animal lovers like Bill and June, is crucial. Companion pets are more than just something to cuddle with. They are friends. They motivate a person to try to be more active. They are someone to talk to… and regardless of what anyone says, they communicate with us as well. They give a sense of purpose. And they give an elderly person who often feels lonely and forgotten the chance to feel needed. Although I have my age (35) and health (could lose some weight, but otherwise in great shape) on my side, I do suffer from bouts of depression. And I am an animal lover… so I know just how powerful a medicine a companion pet could be. 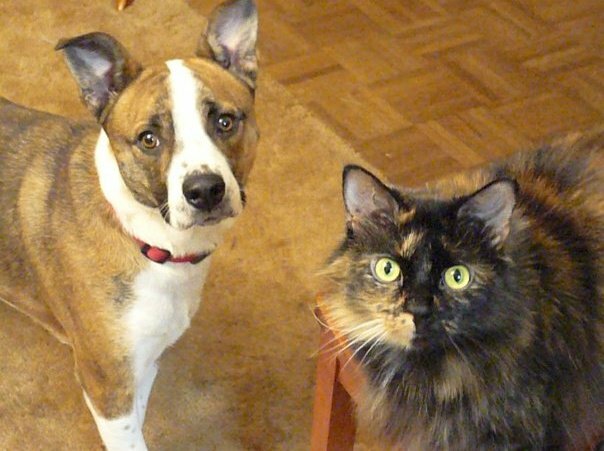 My cat (Callie) and dog (Omar) frequently nurse me out of dark moods and elevate my mood in simple little ways. The need to walk my dog on a daily basis forces me to get out in the sun (God’s natural anti-depressant) and get some much-needed exercise. My cat’s demanding nature means I don’t get to hide. From time-to-time, I have to pet her. From time-to-time, I have to feed her. From time-to-time, I have to play with her. And “no” is not an acceptable answer to a cat… ever. Slowly, nursing homes and hospitals are beginning to realize the value of companion pets to the lives of the elderly and the terminally ill. I hope that they will continue this trend until all hospitals and nursing homes are more tolerant of therapy animals and pet visitations. As for me… I came home and without hesitation, put my dog on his leash and took off for a nice, long walk, praising God all the way that I have found the best dog in the world to be my companion. A friend worked for a time selling hearing aids. He visited a nursing home and was given permission to speak with residents there. One tiny lady it was told was such a grouch nobody wanted to be around her. She gave staff, residents and visitors alike a difficult time. But because the handsome young man seemed to polite she consented to a hearing test. It turned out that she had lost almost all of her hearing. So she was fitted with aids. A future return to the home there was the sound of a piano and a beautiful voice singing. Turned out the lady had been a classical trained pianist and singer in an earlier day. What a gift! She was now once again able to do something she loved and her fellow residents received a warm personality in the bargain.